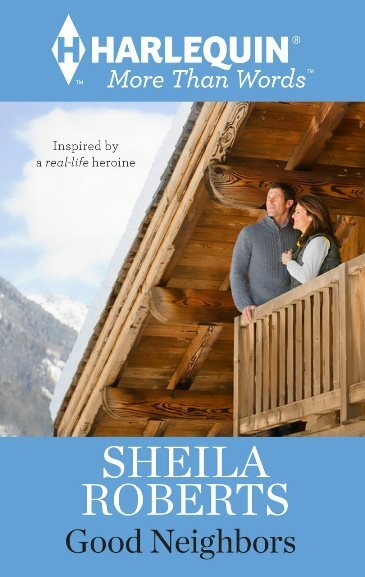 Good Neighbors is a 2013 ebook by regular Harlequin author Sheila Roberts. It is part of the “More Than Words” series that are inspired by real women. More Than Words is a Harlequin program that recognizes three women each year for their contributions to their communities. It started in 2004, but it is currently “being restructured,” so the future of the award is unsure. This book recognizes the work of Sally Spencer, a Toronto woman who founded Youth Assisting Youth, a peer support program for teens. A problem with ebooks is one is never sure of their length. When you pick up a paper book, and flip through the pages, you get an idea of how long it is. With ebooks, there may be a page count or word count, but there is not the same feeling of rapidly decreasing pages in your right hand. The end may come before you are expecting it, and you are left wondering, is that it? That was the climax? Meredith and teenage son Leo are starting over in a small town. Thanks to her late husband’s gambling debts, she has almost nothing to her name. (Her late husband, who died driving drunk, is not the child’s father. She met him when Leo was three, and initially thought this very wealthy man was Prince Charming. I can’t help wondering if there’s a prequel about when they met.) Meredith went from rags to riches, and back to rags, but at least she still has her family’s old cabin. Unfortunately, her husband forged her signature and sold the cabin to Jed. Jed is one of those mysterious nice guys that pop up in romance novels and are so rare in real life: Wealthy, stable, straight, and single. He’s looking forward to setting up a summer camp for his peer supporting youth organization (modeled after one in Toronto), and has just acquired the last piece of land he needs to make the dream come true. He’s not happy to find a woman and her kid claiming the land is theirs, and perhaps he’s not that nice – the question of who owns the land goes to court. Meanwhile, Leo is hanging with the wrong crowd, and tosses a rock through the window of the man who’s trying to take away his mom’s house. Jed spots a youth needing assistance, and gets him involved with the youth group. Jed also spends some time with Meredith, and she’s wondering if third time’s the charm, notwithstanding the property dispute. The set up is good, but after the meet cute there’s not much stopping the relationship except the simmering land dispute, and it never comes to a boil. Like other events at the end, it wraps up suddenly, leaving one unsatisfied. The relationship develops at a more natural and realistic pace than many romance novels, but this growth is more shown in summarizing chapters than lovingly told. And my inner feminist was slightly annoyed that in story celebrating a youth organization founded by a woman, a man represents the organization. I’d like to read something else by this author. The writing is fine, and given the promising set up, I’d like to see if, without contractual obligations to promote something, she can dwell a little more on the romance and offer a more dramatic story. Meanwhile, this is a free ebook download, and it made a fine accompaniment to two lunch specials from the Chinese place in the mall food court.